School of Medicine graduates were part of the UMKC Mid-Year Commencement Ceremony on Dec. 19 at Swinney Recreation Center. Rana Singh, Ehren Ekhouse, Eric Roychowdhury, Ryan Stokes, Gretchen Woodfork, Chiazotam Ekekezie, Vedica Sharma received their M.D. degrees. Greyson Twist, not pictured, received his Master of Science in Bioinformatics. 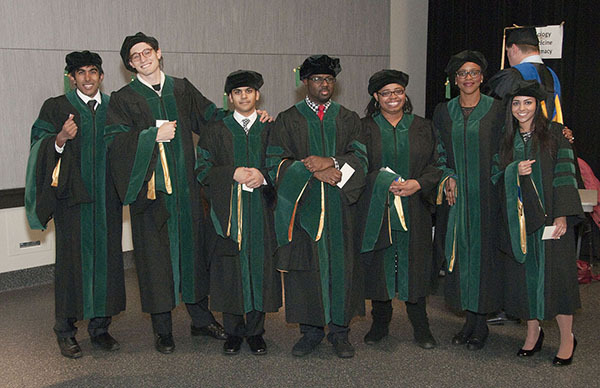 Eight students from the School of Medicine took part in UMKC’s mid-year commencement ceremony on Dec. 19 at Swinney Recreation Center. Seven students received their M.D. They were Chiazotam Ekekezie, Ehren Ekhause, Eric Roychowdhury, Vedica Sharma, Rana Singh, Ryan Stokes and Gretchen Woodfork . Greyson Twist received his Master of Science Bioinformatics degree. The University’s combined mid-year commencement ceremony honors graduates from the Conservatory of Music and Dance, Henry W. Bloch School of Management, School of Biological Sciences, School of Computing and Engineering, School of Education, School of Law, School of Medicine, School of Nursing, School of Pharmacy and the School of Graduate Studies. The School of Medicine will recognize its 2015 spring graduates on May 20 at the Kansas City Music Hall.